Simple, sophisticated design or lavish, romantic decadence – its up to you! 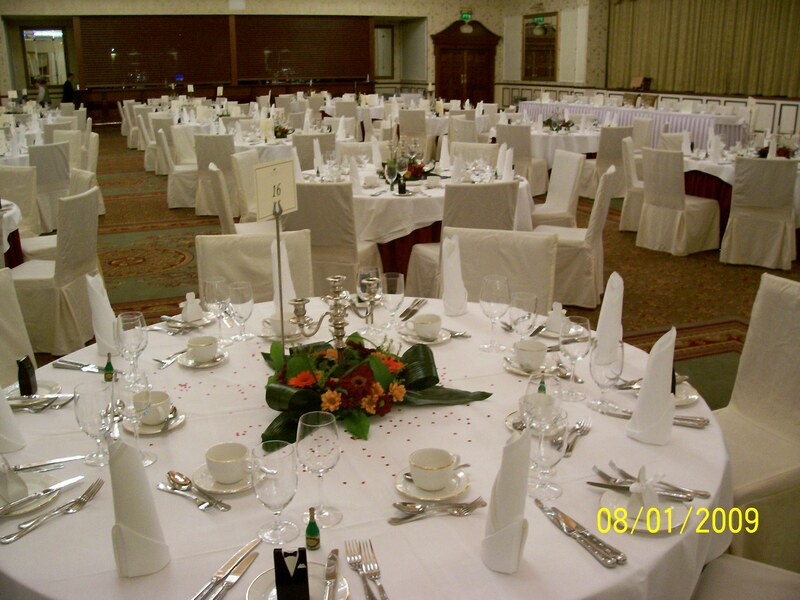 The Reception Venue is the place where you and your guests will spend most of their time on the wedding day so it is important that this area looks well. It is also a more relaxed atmosphere than the Church/Service so this is where you can have a little fun with the decor! Many people give each table a name or theme and decorate with favours and “ice breaking” games or trinkets to get the guests chatting. Many Hotels now offer fresh flower arrangements as part of the “package” when you book and usually these tend to be a standard minimum arrangement. You can decide to have your own arrangements made and delivered to the Hotel if you want something a bit more personal that co-ordinates better with your theme. We also offer a very low cost alternative to having separate arrangements made: we can add flowers in your colours to the arrangements at the hotel. Many of our brides have found this to be the best value option to personalise the space and carry the colour scheme throughout the whole day.